Tom Morello joins Slash in the soon-to-be-released game. 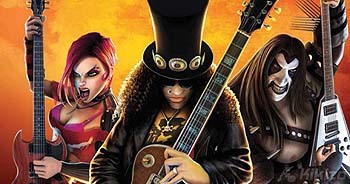 One of the ways Activision will be distinguishing this year's Guitar Hero sequel from EA's Rock Band (developed by Guitar Hero creator Harmonix) is through the inclusion of boss characters. Already the company has revealed that in Guitar Hero III you'll be able to battle Guns 'N' Roses guitarist Slash in a guitar duel to the death. Now another rock god has entered the arena. Guitar Hero III will star as a boss Tom Morello, the talented guitarist best known for his playing in Rage Against The Machine. In the game you'll be able to challenge Morello to a guitar duel, and, should you beat him, you'll be able to unlock the band's hit song Bulls On Parade. You'll also be able to choose to play as Morello. Guitar Hero III is out for PlayStation 3, Xbox 360, Wii and PlayStation 2 later this year. Activision is planning to include a five-song playable demo in its new skateboarding game, Tony Hawk's Proving Ground.